I guess the title of this blog post really says it all: I made this dress for Tabatha for her birthday! Now that she’s had a chance to wear it I’d like to do a little post about it. Making a dress for someone is never an easy task – you get a kind of anxiety that it won’t fit or that it won’t look right, it won’t suit the fabric…all these things cross your mind more than once as you’re doing it. In this case, those were even more heigtened as Tabatha didn’t get a chance to try it on until just before her birthday. Thankfully, it was fine, and it fit her like a glove. I bought this pattern a while back from a sale on SewingPatterns.com, a website I love, in one of their many sales. Seriously, for anyone in the UK looking for sewing patterns, this is the place to go (so long as you plan on buying a few) as they are reduced so much that it’s cheaper paying the postage and getting them sent across from the U.S. I usually buy the maximum allowed each time and, with shipping, it comes to around £40, or around £4 per pattern. Recently, they even had a $0.99 Vogue pattern sale on and given the crazy discount I stocked up. I really stocked up. Vogue patterns are so expensive it was just worth it to do it. Anyway, I digress. I bought the pattern from Sewingpatterns.com having no idea what I was going to do with it. Tabatha was ’round one night, the wine was flowing and she decided on this pattern for her birthday dress. I will admit, I was sceptical of her choice of pattern versus choice of material. I was wrong. I loved how it turned out and so did Tabatha! The pattern (view D, if you’re interested) itself was very easy to follow and suitable for a beginner. I can heartily recommend it. The markings and instructions were clearly laid out and the self lined bodice was a dream to sew. In fact, Tabatha has since borrowed the pattern to make it for a friend, she liked it so much. I’ll leave her to comment on that herself though. The good thing (one of the good things, I should say) about the pattern is that it called for a lapped zip. I don’t know about you, but I find them much easier to place and fit than invisible zips.The navy polka dot cotton itself was also wonderful to sew and was not too expensive from Croft Mill. I love this supplier as well – so easy to deal with and reasonably priced. I ended up using a little of the left over material as a trim for another dress which I will be writing about at some point in the future. I also bought some gorgeous red chambray from there with the intention of making the Colette Ceylon dress from it, but I’ve had a different idea in the meantime. More on that to follow! 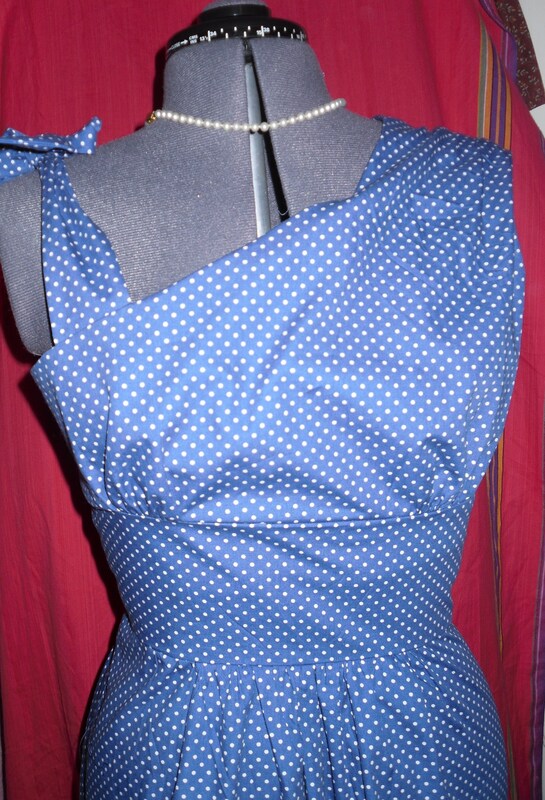 I even bought so much of the navy polka dot cotton I have enough left over to help me out with another dress. Well, here it is, I hope Tabatha enjoys it! I love this dress! Thank you so much for making it for me. I’ll let you know how it goes when I attempt to make it for my friend. She obviously liked the fabric for the dress too, as she has requested the same but in red! Did you manage to find it ok? There’s some red on Croft Mill if you need it! Did I tell you i got the light blue as well? It’s lovely – I might make something for the house from it. Maybe for christmas! I got some off eBay! Am looking for turquoise polka dot now though for mother-in-law’s Xmas pyjamas – found some on eBay but not bought it yet in case something cheaper comes along!